Old Ardmore National School. Built in front of St. Declan's Catholic church in 1878 following the loss of the older school on the back of Ardmore strand due to coastal erosion. 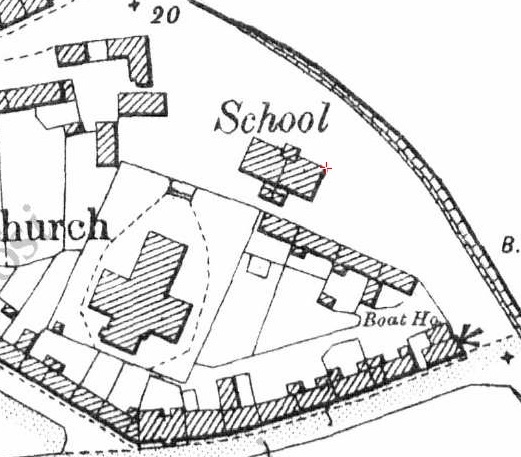 The previous school was located about half way across the beach, on the old road to Curragh, in a line with the church gate. It was built in the 1850s and only lasted about 20 years. It was in the Chapel Row school building that the local branch of the Irish Country Women’s Association was first formed under the chairmanship of Mrs. Christina Rooney, in 1953. Regretfully the building was demolished in the mid 1950s, shortly after the opening of the present school in 1955. The eastern gable end of the school was plastered and was used as a handball alley by generations of Ardmore people, and produced Ardmore’s first All Ireland winner - the late Jimmy McGrath - for handball.